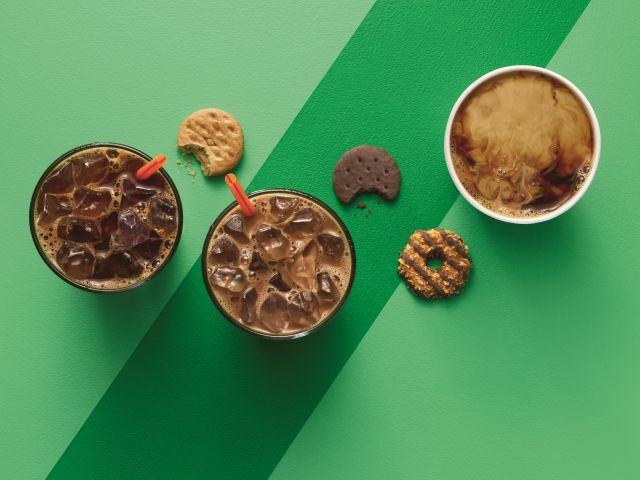 With cookie-selling season in full swing, Dunkin' Donuts partners with the Girls Scouts to introduce three new Girl Scout Cookie-inspired coffee flavors. - Thin Mints - Cool mint and chocolate. - Coconut Caramel (Samoas) - Toasted coconut and creamy caramel. - Peanut Butter Cookie (Tagalongs) - Peanut butter. You can add the flavors to any of the chain's hot or iced coffees, lattes, macchiatos, frozen coffee, and frozen chocolate. You can find the Girl Scout Cookie coffee flavors at participating Dunkin' Donuts locations nationwide starting February 26 through May 2018.